Interested in being a student advocate, joining student government or being a leader in a club? LEAD Academy provides experiential learning opportunities to enhance your organizational leadership skills, explore current issues influencing higher education, and learn how to be a more effective student advocate. This unique program is run by Associated Students, Inc. (ASI), Fresno State’s student government and official student voice! For more information on session descriptions, please visit http://fresnostateasi.org/lead-academy/ or contact Tara Powers, ASI Director of Operations at 559.278.2656 or 559.360.8921. ASI is proud to serve ALL students! If you require any special accommodations or have a request on how we can make the experience more meaningful to you, please let us know! 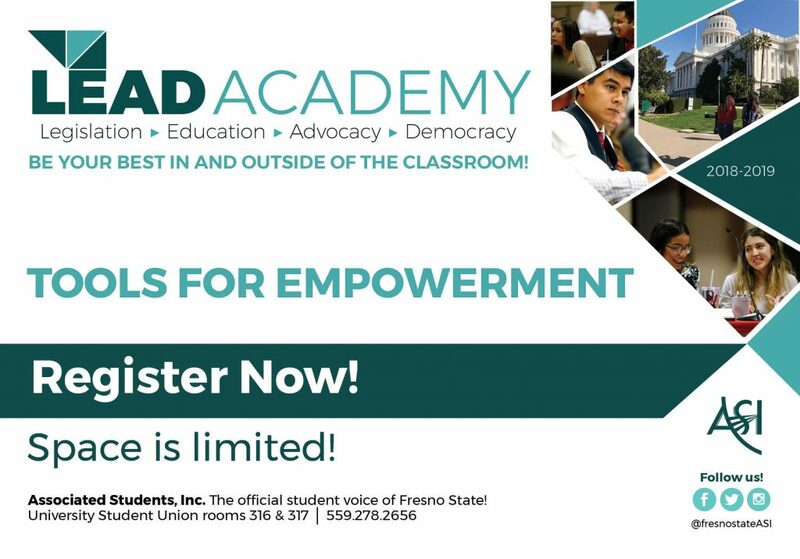 LEAD Academy is a program run by Associated Students, Inc., Fresno State’s student government and official student voice! Space is limited and is on a first come, first serve basis.